Things will not start escalating until chapter 30+. So don’t go expecting some exciting stuff to happen till then. Well, just sayin’. Also, I need an editor. The quality of my chapters are going down a little, and I feel like I need a manfriend to help me out. You don’t need to know any Korean. You just have to read and edit the chapter a little so that it becomes… pretty. Send an email to ensjtrans@gmail.com if you’re interested. Thanks. The number of people that gathered in order to strike down the Heavenly Demon Church numbered around 5,000 men. Since their numbers kept on rising as others joined in, the estimated number of martial artists in their group would number about 8000 when they would fight the Heavenly Demon Church. Thanks to the immense amount of people here, the Gansu Branch of the Alliance were extremely troubled. The people they could house in the Gansu branch were limited, so they were unable to hold all the members that came in. Because of that, the Gansu branch rented out all the houses in the area to house the members of the Alliance. However, even that was reaching its limit. There really were an immense amount of people coming in. Since crowds of people who claimed to be allies of the Alliance kept gathering, the Gansu branch eventually had to build tents for the newcomers. The strategist of the Alliance. The old scholar, who was nearing the age of 60, was reporting something politely to a person. There weren’t many people he had to show respect to in the martial world. The person in front of him was one of those people. That man was one of the three sovereigns, Baek Mu Ryang, the Dao Emperor. He, who had a saintly look about him just a moment ago, suddenly grinned. Sanguan Zhongda had a faint smile on his face. The hidden truth. It was the fact that the Heavenly Demon Church was actually after the tomb of Ak Jung Pae, the Sword Demon. He leaked that fact a little on purpose. The effects were immediate. Multiple clans that belonged to the Alliance gathered their elites, and sent them here. They were obviously aiming to take the legendary martial arts technique. They weren’t here to destroy the demonic church. The Alliance pretended to not notice their intent. The Heavenly Demon Church’s trait as a religious group made them very hard to infiltrate. Even if someone managed to get in, they would always stay in the outer circle of the church. The church’s closed nature proved to be useful in keeping out information. The Dao Emperor Baek Mu Ryang started tapping on the table next to him, and spoke. Baek Mu Ryang had a playful smile on his face. Baek Mu Ryang made a sad expression when he heard this. The figure they are talking about. They were talking about the Dark Demon Emperor, Gongson Chun Gi. Of course it would be hard for the likes of Baek Mu Ryang to understand. That man was only interested in fighting, so the man was a little lacking when it came to politics. Despite all that, the reason why Baek Mu Ryang was able to become the leader of the Alliance was because of his unparalleled strength. His immense strength was what gave him power and fame. Gongson Chun Gi possessed undisputed strength, and he also was talented in politics. Sanguan Zhongda didn’t want to admit it, but Gongson Chun Gi’s every move was something that had every possible situation imaginable accounted for. This was something that had to be noted carefully. To think there was one more person who knew about it other than he. It was quite a shock. The balance between the three powers. To think that the one maintaining it wasn’t him, but the Heavenly Demon Church……. It wasn’t’t something he could easily accept. It hurt his pride quite a lot. The one that planned everything up till now was Sanguan Zhongda. He was the one that made the leader make his move, and he was also the one that leaked some info to the clans. That’s how he created this immense battle between the two sides. Just to confirm one thing……. But even that will be too hard now. The things that were at stake here became too big. In the worst scenario. One of them would suffer a hit they won’t be able to recover from. Then the balance would crumble. That cannot be allowed to happen. They decided to work with the Dark Moon Guild with that purpose. If only one of the powers take a hit, the balance would crumble. Then what would happen if all three of them took a hit? The balance would be maintained. The Black Moon Guild was actually the variable that made the two other powers hesitate from making a move. If Gongson Chun Gi showed even a slight movement of trying to avoid the fight, Sanguan Zhongda would do anything in order to cancel the fight between the two powers. He was massaging his forehead as he was looking at the White Tiger Lord. Sanguan Jin Gul, Sanguan Zhongda’s nephew, nodded and spoke. Sanguan Zhongda’s tired face turned into one of interest. Since a long time back, he had constantly tried to create inner conflicts within the guild. His strategy somewhat worked, which caused various cracks to appear in the Black Moon Guild. But the one that was carefully fixing these cracked was Neng Ha Young. She was only 15. At that age, most girls would fanatically try to collect various accessories, but not Neng Ha Young. She was carefully trying to maintain the balance between the guild and the Alliance in the shadows. She wasn’t someone to be taken lightly. 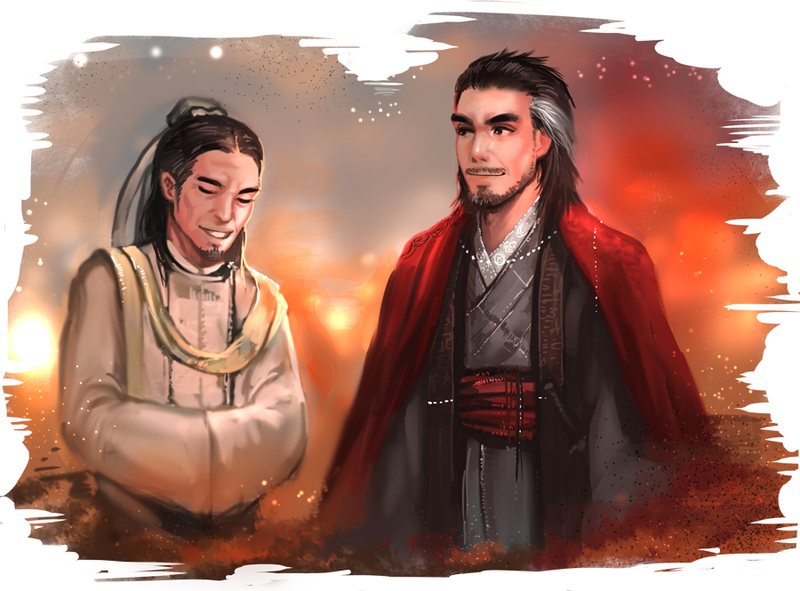 Seeing the expression on his uncle’s face, Sanguan Jin Gul made a satisfied smile. Sanguan Zhongda tilted his head a bit when he got the document from his nephew. That was because he had seen a name that he didn’t recognize on it. Sanguan Zhongda made a confused expression as he put the document down. Sanguan Jin Gul made a surprised expression. His uncle always did things the official way, no matter how urgent a matter was. But to think that this uncle would be this rushed…. Did his uncle find this matter extremely important? Sanguan Jin Gul’s face turned serious. What’s the Heavenly Demon Church got anything to do with this? Sanguan Zhongda didn’t understand. But when he heard what his nephew said next, his face stiffened. Sanguan Zhongda’s face changed greatly. This wasn’t something that couldn’t be ignored. Sanguan Zhongda nodded when he heard this. And he gestured his nephew to continue. When he saw his uncle’s gesture, Sanguan Jin Gul organized the information in his head based on the level of importance. He then told his uncle these information carefully. Sanguan Jin Gul made a happy face when he got praised. After all, his uncle rarely praised anyone at all. A brat appeared at an unexpected time. Sanguan Zhongda began thinking. He soon opened his mouth. Sanguan Zhongda began thinking. He soon spoke. Even now, Sanguan Zhongda didn’t realize what kind of a relationship he would have with Cho Ryu Hyang in the future. The clan leaders gathered here made an awkward smile when they heard this. When the king of all the beggars in the martial world, Tae Eul Shen Gai, said this, the tense atmosphere in the room relaxed a little bit. Looking at the old beggar, the chief smiled. The chief looked at Tae Eul Shen Gai with a sorrowful look, and spoke in a low voice. Tae Eul Shen Gai’s face went red as he started to complain, but the chief didn’t stop teasing the man. The chief took a look at the old beggar’s face for a moment, and then nodded with a face of understanding. Why did the chief always tease him? While Tae Eul Shen Gai was trying his best not to start complaining, the chief went on talking. The representatives of the clans all nodded. While they did come here because of the Sword Emperor Flag, they all had ulterior motives for being here. No one was daring to say it out loud, but they were all here to take it for themselves. To them, the Heavenly Demon Church was just an obstacle. Sanguan Zhongda, who was standing behind the chief, made a confused expression. Why did the chief make it sound so grand? Just what was the he going to say? Sanguan Zhongda started getting anxious. Everyone at the meeting room made a strange face. They were all keeping their movements secret. Since this was a matter that was quite embarrassing to talk about, everyone pretended to not know anything about it. But why did the Sword Emperor mention this? What did he have in his mind? When Tae Eul Shen Gai said this, Baek Mu Ryang nodded. Tae Eul Shen Gai thought a little bit, and nodded. Come to think of it, he never saw the chief lie. Looking at that, the leader of the Hebei Peng clan, Peng Mu Chun (彭蕪淺), laughed out loud. Sanguan Zhongda stood behind Baek Mu Ryang with a stupid look on his face. The chief he was looking at now wasn’t an ignorant musclehead. He was a clear-minded person who was analysing the situation quite accurately, and he also knew how to make the situation be advantageous for him. The chief seemed to have a sly side to him, too. The meeting room, which seemed quite unmotivated just a while ago, was now bursting with energy. The power to move the hearts of men. The chief, feeling the heat in the air, glanced behind himself. Sanguan Zhongda was standing there with a pale face. It seemed the chief expected all this from the start. Sanguan Zhongda made a bitter smile when he heard the chief’s message. He was being played all along. The chief just struck him at the best possible moment. This gave Sanguan Zhongda quite a shock. Sanguan Zhongda bowed down to the chief with a feeling of defeat. He was thanking the chief for teaching him a new lesson. Looking at that, the chief smiled. It was finally time for the Alliance to rule the martial world. A still pool of water was bound to spoil. Sometimes, someone had to clear it out, even with excessive measures. That was what the chief thought, and the chief’s decision would spill much blood on the martial world. The first Alliance/Demon war was about to begin. Thank you for the translation. This is a amazing story! I have no idea wtf is going on and who is doing what for who and why. The good guys are gathering to get rid of the Heavenly Demon Church. There. A short summary of what just happened. Thanks! Hm, lots of politics…i’m just interested in Cho Ryu Hyang and his development, and his teachers…oh well! I’ll just wait for the chapters for those…! Also, to translator ensj,(is it ok for me to call you that? )lol, you want a manfriend? I don’t know if i could help you with that. I could be your friend though, haha! This wasn’t something that couldn’t be ignored. that could be ignored. The problem with yours is obvious and a similar one was already noted to you, so I won’t write down why. Double negatives, double negatives everywhere!